Good Thursday! How exciting we’ve got a nice long weekend coming up. You better believe the boys and I will be hitting up Disney! 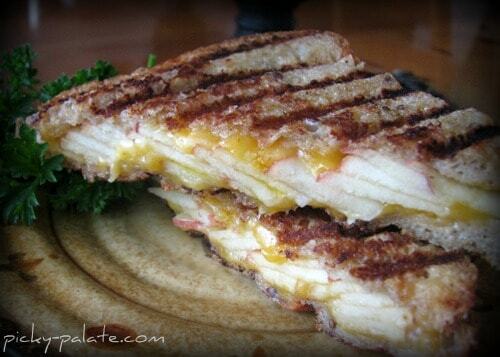 Last week for lunch, I decided to put apple slices in my grilled cheese. I couldn’t imagine it tasting good, but I’ve always heard about the whole apple/cheddar combo being really tasty. To my surprise, it’s fantastic! You don’t believe me? Take 5 minutes and make one for yourself! 1. Heat a small skillet or grill pan to get the panini look over medium heat. Place buttered side of bread #1 down in hot skillet. 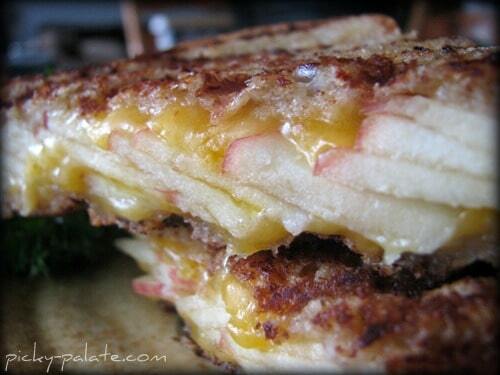 Layer bread with half the cheese, the apples then the remaining cheese. Top with bread #2, buttered side up. Grill for 1- 1 1/2 minutes per side pressing on sandwich (to get grill marks) until golden brown on each side. Remove, slice, dip in Dijon and EAT! Have a terrific LONG Weekend, come back soon for more “healthy” cookin’ over at Picky P! I can’t believe you guys get to Disney a few times a week! That would have been so amazing as a kid. 🙂 Love apples and cheddar together – makes a perfect sandwich. I LOVE apples with cheddar!! Have fun at Disney! Ooh that sounds really good! There are so many possibilities with a grilled cheese! 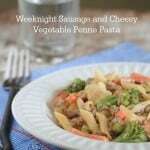 I think I’m going to make this for dinner tonight. It looks fantastic! They look so crunchy and good, wish I could reach out and take a bite. I love apple/cheddar! That’s genius, pure and simple. 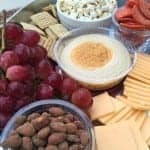 One of my favorite snacks from my childhood was a bagel, sliced in half, each topped with a generous slice of apple and sharp cheddar cheese, toasted until the cheese started to bubble. 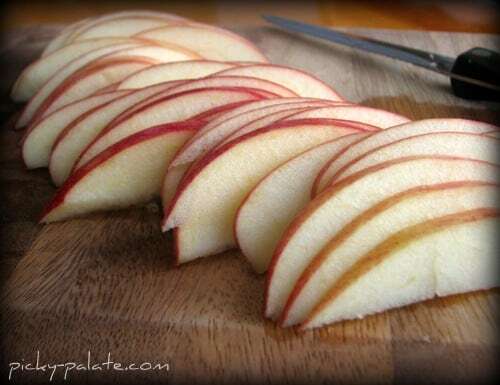 Apple with cheese is one of my favorite combinations — yum! Hi, I have tried your mini cheesecakes recipes. I finally go tthe pan. Had to order it online. Loved them ! I was wondering , do you have anymore mini-cheesecakes recipes? You’re right, it doesn’t sound good! But somehow your photography makes it look so irresistable! I must confess though, during one of my pregnancies I craved apples and cheddar cheese together! So I know it is actually pretty good. Oh Apple pie is only good with melted cheddar on top! Never thought of it as a sandwich! 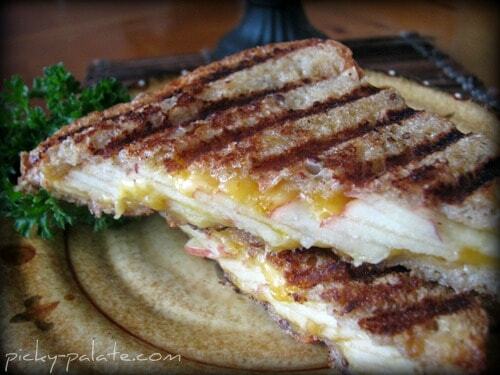 I love cheddar and apples together but have only had them plain as a snack–I love this sandwich idea! Must try soon. The pic itself makes my mouth water. Will definitely make this over the weekend. Thanx so much! YUM! Have fun @ D-land! That looks yummy. I like cheese on apple pie. I posted a healthy and DELICIOUS recipe for Cilantro Pesto Chicken on my blog. You should give it a try. My kids LOVED it! I know what I’m having for lunch! Oh my gosh does this look amazing. You’ve got talent!!!!! How was your holiday? Sorry I have not been by recently. Your combination of ingredients is perfect. That’s great you’re using whole grain bread. I’ll definitely try this for breakfast someday! Thanks for writing this fantastic blogposting. I genuinely just like the fashion which you use to create about things. It absolutely was really educational and I need to many thanks you for thaking the time to create about it. Many persons would explain this stuff so more complex, but with your statements I definitely understand now anything. I am sure I’ll examine back again your site and my rss reader will like your stuff as well. Great website. Plenty of helpful information here. I am sending it to several buddies ans also sharing in delicious. And obviously, thanks on your effort!